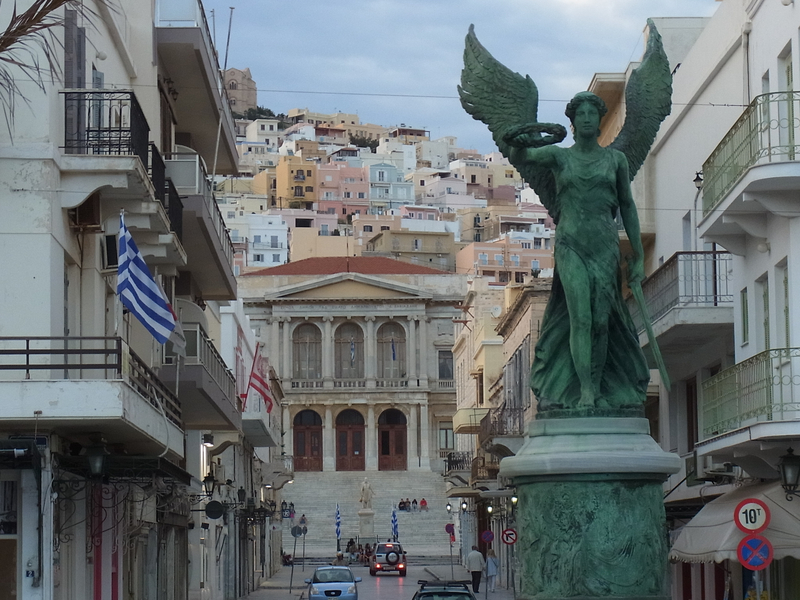 Today Syros with its capital Ermoupolis is an island gem with a well-developed economy, tourism and agricultural production while the operation of the shipyard, of public services, of the Department of product and systems design engineering at the University of the Aegean as well, contribute to the long-term development of the island. Prehistoric findings in the areas of Halandriani and Kastri prove that Syros has been inhabited since the 3rd millennium BC and also had a great commercial activity while various evidence for the existence of metallurgy plans bears witness to the island’s relationship with Asia minor. During the 2nd millennium Syros is found under the rule of the Phoenicians, of Minoan Crete and the Mycenae while in the 1st Millennium the island passes to the hands of the Ionians. From the 7th to the 3rd century B.C. there are traces of settlements and rural areas in different parts of the island. In the classical and Hellenistic period Syros joins the Athenian Alliance with its own currency and administration while during the Hellenistic period findings of temples are brought to life like the one of the philosopher of antiquity Pherecydes between Richopos and Platy Vouni in Ano Syros. The cosmologist Pherecydes was born and died on the island in the 6th century BC. He was a teacher who taught in Samos some of the greatest scientists of ancient times such as Pythagoras, and is said that he spent most of his life inside a cave. The cave survives to the day in a magical landscape where earth and sky become one, where the view to the sea can only be described as miraculous. Apart from being a great philosopher Pherecydes was also the inventor of the first solar clock, also known as the Sunflower of Pherecydes. The sunflower looks like a sump or well that could be used in antiquity for the irrigation of water. In fact it is an ancient and expensive solar observatory that marks the time and the 4 seasons of Syros depending on the motion of the Sun. This prehistoric Sunflower is located in the village of San Michali. The copper coins found on the island from the Roman times and the issuance of silver coins in the 2nd century BC show commercial development while the invading pirates during the Byzantine period cause the abandonment of the island. 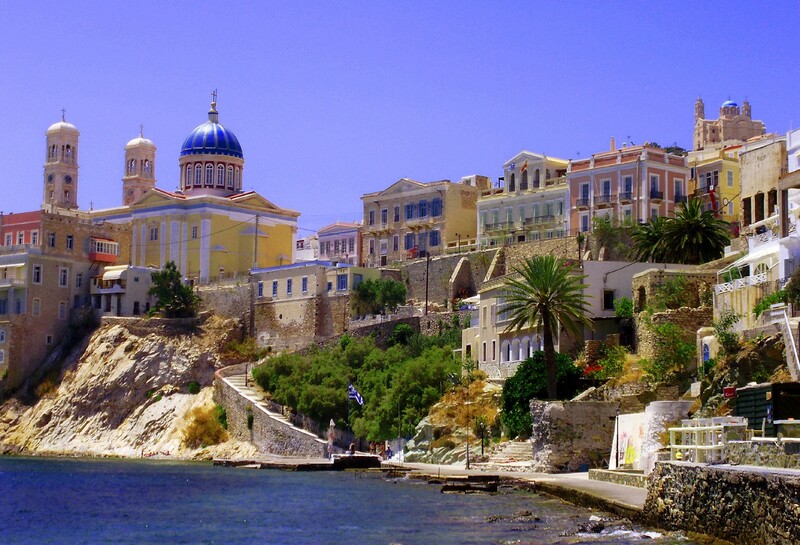 Soon Syros becomes part of the Theme of the Aegean Sea and the first Catholic settlement of Ano Syros is created under the rule of the Venetians. In the Ottoman period Syros passes into a new era characterized by the reduction of taxes, the freedom of religion and the establishment of both the Capuchin Monks and the Jesuits who leave their individual mark on the island. In 1728 the island suffers from the plague, but slowly and gradually until the 19th century it reaches an economic growth and moves towards the development of a self-government and a public assembly. The island’s population doubles, reaching 4000 inhabitants and begins to show a great improvement in the fields of trade and shipping. 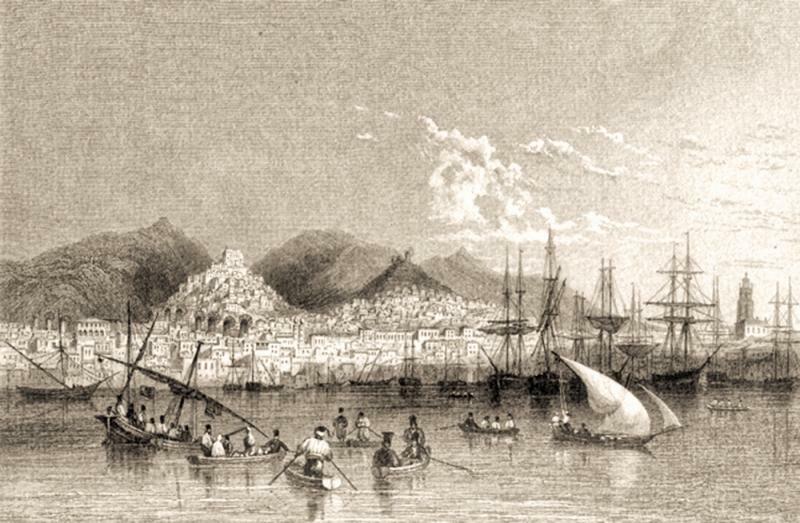 During the Greek Revolution of 1821, the refugees from Smyrni and Aivali as well as from the nearby islands find shelter on the island where they built the first houses as well as the first Orthodox temple and slowly transform Ano Syros into a city-jewel, a city characterized by its vibrant spirit and its magnificent architecture, a city that gave a boost to businesses that slowly and steadily began to grow. With 22,000 inhabitants in 1889, the town of Ermoupolis becomes a superpower engaged in manufacturing, shipping, building activities, tannage while promoting intellectual freedom with the establishment of schools, clubs and theaters such as the Apollo theater that quickly began to blossom. The 20th century, however, starts with unpleasant omens for the island, the power acquired by Athens and Piraeus, the opening of the Corinth Canal, the development of steam navigation and the occupation period (1940-1944) slowly bring complete destruction. After the occupation, the limited agricultural production carries on while factories begin to close down the one after the other and the population of the island diminishes day by day. But slowly and gradually Syros is reborn from its ashes, it is once again molded and transformed as culture is a concept deeply rooted in its grounds. The island’s spiritual and artistic tradition begins to attract tourists of high cultural and social status. The exceptional mansions as well as the unique architecture of public buildings in Ermoupoli give the feeling of an open-air museum that slowly begins to be acknowledged by the continuous visitors.